When it comes to the subject of bugs, size really does matter and cockroaches are no exception. You may be thinking "The bigger the icky bug, the worse." Well, to your surprise, that's not the case with roaches. The smaller in size German cockroach is a far bigger threat than the more commonly-known American one. Why, you ask? Let's just say that the German equivalent likes to make baby bugs, and by "like" we mean that it can produce more than 30, 000 a year. And now imagine those 30,000 cockroach eggs hatching inside your house walls. Got the chills? But don't go into panic mode, there are ways to stop a cockroach infestation. First, you need to know how does an infestation occurs and what are the factors. In this article, we will cover important details like do roaches lay eggs, why they lay 'em, how they do it, and many more unpleasant, but helpful facts. Ready? Set? GO! What Do Cockroach Eggs Look Like? What is ootheca and how many eggs does one have? You may be wondering what exactly is an "ootheca"? Basically, it's a sack-like thing containing eggs and it looks disturbing like everything else bug related, you can see its physical description in the list below. You can read about the number of eggs that a single ootheca contains in the "How many eggs do the bugs lay?" part of the article. Location: ootheca are hard to see, because of their size and location. The lady cockroach has a tendency to hide her offspring in small holes and cracks. Is it a cockroach egg or rodent droppings? Many people mistake the bug's eggs for mice or rat dropping. The reasoning here is that indeed they are quite similar in shape, size, and colour. To make sure what kind of pest you are dealing with, carefully inspect the specimen. Rodent droppings are oval, textured and soft, while ootheca looks crunchy and is clear-cut in shape. If you decide to touch them, make sure to wear protective gloves. Both droppings and ootheca can be dangerous to your health. Where Do Cockroaches Lay Their Eggs? Any room that is regularly damp such as your basement or laundry room. Do all cockroaches lay eggs? Which ones do? Not all roach specimens lay eggs. The ones that do are the German ones, the Oriental, Brown-banded and American cockroaches. Those types of bugs' hatching system are based on the "oviparous" method, which means that their young grow in eggs outside their mother's bodies and they don't need their mother around in order to hatch. Other roaches are "ovoviviparous", which is exactly the opposite of "oviparous" - the eggs stay inside the mother where they receive the needed moisture. Today we are going to discuss the first sort. How many eggs do the bugs lay? Each sort of oviparous cockroach has different specifics when it comes to reproduction. This kind of roach reproduces faster than any other of its species. It can go from an egg to a fully functional adult in 50-60 days. Once fertilized, the lady roach grows the so-called ootheca filled with eggs. An ootheca can contain up to 50 eggs. It takes around 24 hours for those to hatch. One female roach can give birth 6 times per year. 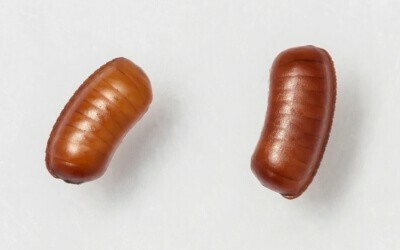 Like the German cockroach, the American one also produces an ootheca. Two days after fertilization, the egg sack is stored by the mother in a safe place. On average the female American cockroach can make 9-10 ootheca. The immature baby roaches emerge from the sacks after 6-8 weeks. This sort of roaches also leave an egg sack after insemination. The only difference is that they deposit it after a week and the young bugs hatch after a month. During her lifetime, a lady Brown-banded cockroach can give birth to 14 egg capsules, containing around 13 babies. The hatching stage can take more than 3 months. Cockroaches are known to carry pathogens due to the fact that they are not the "cleanest" bug you can meet. If you have any type of allergies, the roaches can trigger them. Their ootheca has the same qualities. Symptoms of allergies caused by the bugs and their eggs are coughing, nasal congestion, skin rashes, wheezing, ear infections and sinus infections. Can cockroach eggs spread around or do they stick to surfaces? The roaches ootheca isn't sticky and won't get attached to your clothes, walls or any type of surface. That makes them quite easy to clean, but the downside is that you are going to have a difficult time finding them in the first place. Cockroaches prefer to store their future children in warm, moist and dark places, such as cracks and small holes, generally tough to find spots. How To Dispose Of Cockroach Eggs Safely? To successfully get rid of the eggs, you need to get them as far away from your property as you can. Try to vacuum or carefully collect them. Once you have gathered them all, take the eggs outside and throw them in the garbage can. Make sure that the disposal area is far from your house because if the ootheca hatches, the new cockroaches may find their way back. What Will Kill Cockroach Eggs? The first task is to find the eggs of course. Methods like spraying, freezing and using a vacuum do actually kill the ootheca but won't do you much good in a full-on infestation situation because as we mentioned earlier, roaches like to hide their eggs well. A far more efficient way to get rid of the offspring is to apply an insect growth regulator in the locations in which you have spotted cockroach activity or just to hire an exterminator that can solve the problem once and for all. We hope you found this article helpful in the battle with cockroaches. Now that you have gained the required knowledge, put your war paint on and go kill some unwanted guests!